Nothing sparks joy quite like chocolate. But did you know that the happiness buzz you get from a square of dark chocolate is caused by brain-loving nutrients? Dark chocolate contains alkaloids, which interact with neurotransmitters in our brain to stimulate those good feelings. Dark chocolate also contains antioxidants, magnesium, fiber, and flavonoids, making it a superfood (and a super delicious one at that). If you’re not already dreaming of chocolate, then consider this. Researchers recently discovered that the antioxidants and flavonoids in cacao and cocoa increase gamma ray frequency in the brain, which leads to improved memory and cognitive processing. Just 48 grams of 70% dark chocolate can improve memory, information processing, and mood in as little as 30 minutes. The boost in brainpower can even help prevent cognitive processing pathways from eroding as we age. 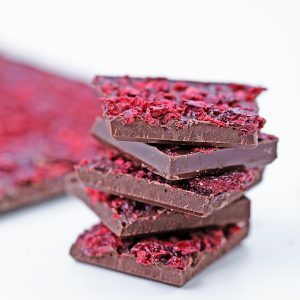 And speaking of anti-aging, epicatechin, an abundant flavonoid in dark chocolate, may prevent muscle tissue degeneration as we age, and can even increase our lifespan. However, the benefits of dark chocolate are most potent in minimally processed varieties. Raw cacao retains the most nutrients, with a serving of raw cacao boasting the same amount of antioxidants as a serving of blueberries. Chocolate bars, on the other hand, contain roasted cocoa, sugar, and other ingredients that counteract the health benefits. To get the most from your chocolate, choose cold-pressed, raw cacao. But, when you just can’t say no to the chocolate bar, watch the preparation of this delicious dark chocolate recipe. And Happy Valentine’s Day!